Martha Berry thanks Mr. Hammond for his $150 scholarship gift for the girl who wrote the article "A Day in the Mountains with Miss Berry" for the Southern Highlander, but informs him that she works in Miss Berry's office so she'd like to give it to some girl or boy with his permission. She discusses the Hammond's upcoming visit to Berry with the New York Pilgrims. 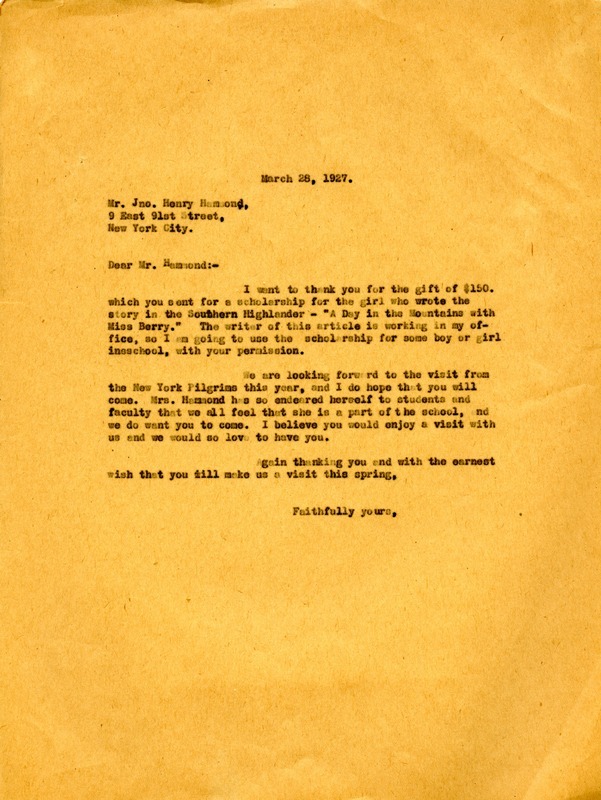 Martha Berry, “Letter to John Henry Hammond from Martha Berry.” Martha Berry Digital Archive. Eds. Schlitz, Stephanie A., Sherre Harrington, Chelsea Risley, Alan Henderson, et al. Mount Berry: Berry College, 2012. accessed April 18, 2019, https://mbda.berry.edu/items/show/4025.